Ok, apparently, I need to keep my taste buds in check now and then. Whether its once every other week or maybe every third week, I need to inject either Ben & Jerry's or Häagen-Dazs into my ice cream diet. Even though I've really been enjoying the Stone Ridge creamery chocolate chip ice cream these last few days, it only took one bite of this delicious flavor melting in my mouth to remind me of how great ice cream can be. Am I exaggerating? maybe a smidge, maybe even a tad, but not really. Come on, this is Häagen-Dazs we are talking about here, they don't make junk. Sure, I don't like their Sorbet, but I don't think I would like anybody's sorbet. This ice cream is really good. Sure the fat content is insane and you'll feel guilty the whole time, but it's really good. 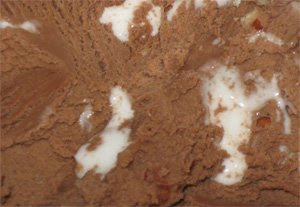 The high quality chocolate definitely leans towards a cocoa flavor (as opposed to a more traditional "chocolate" ice cream). The almonds are plentiful and very fresh. The marshmallow is very unique, it's almost liquidy. As you scoop, it starts oozing everywhere. It must be the plastic seal that keeps it fresh and oh so gooey. Together they are fantastic, maybe one or two many almonds, but I haven't decided for sure. The thing that won me over was my second bite. It perfectly melted in my mouth and and my brain went to ice cream heaven. Oh, so good. So fatty, but oh so good. Definite winner here. Would I justify the high fat content over a tasty Rocky Road like Breyers*? No, but every now and then, you know, before running say 5 or 6 miles, yeah, I could eat this. Ten years ago this container would have been gone in one sitting. Oh joy, it even has a nice chunk of your daily cholesterol. Nice touch. On Second Scoop: We all agree, this ice cream is fantastic, just top notch stuff. The chocolate is just so rich and full of true cocoa taste. My only warning, which is my fault, not their's, is be careful of the Marshmallow. It is very sweet and I landed right it a big pool of it. I couldn't resist the urge and took a huge spoonful that was probably 70% marshmallow. Wow!! So very sweet! Little too sweet actually, think my brain just spun once or twice. It really is great, just remember that when you scoop, the marshmallow is there to accent the chocolate, not bury it. *Update: Breyers has messed with their Rocky Road and I am unamused. The reason their marshmallows are so oozy is because they use marshmallow cream and not true marshmallows. I hate this ice cream. I love the texture and mild sweetness of marshmallows, Marshmallow cream is like liquid sugar and ruins the Rocky Road. 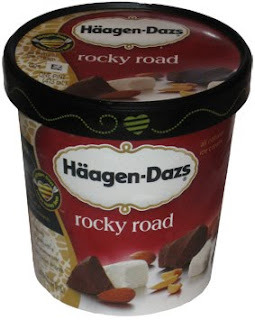 i am a rocky road fan, that is until i tasted haagen-dazs rocky road. 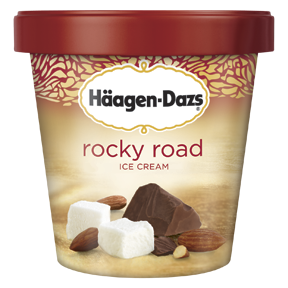 i dont know what you people are smoking but haagen dazs rocky road is awful. the worst ive ever tasted. who wants slim in their ice cream. thats what you get with haagen dazs marshmallow. really slim. disgusting. way to ruin marshmallows in ice cream haagen dazs. what a waist. i just bought a pint of it an guess what i trashed it all in 10 minutes. can i get a refund. Slime is a good description for the excuse for marshmallow in this rocky road. Ick, exceedingly sweet and included in huge amounts. Great way to lessen you ingredient costs and boost your bottom line. Not really a fan of this one. Too sweet, and not enough texture. Would personally prefer the almonds crunchier and salted, or something to add interest. I'm good with either marshmallows or marshmallow swirl, but this marshmallow doesn't do it for me. Overall just too sweet without any richness to the flavors.